At the formation of the Georgia provincial Congress, Walton was elected Secretary, and made President of the Council of Safety. In 1776 he was elected to the Continental Congress, where he signed the Declaration of Independence. 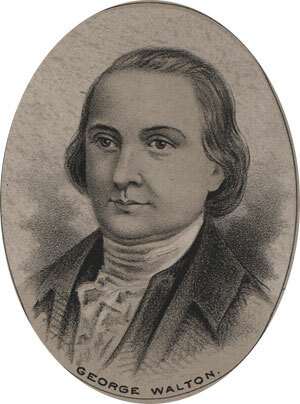 He spent many of the following years engaged in the defense of his state, and in a messy political battle with Button Gwinnett, another signer from Georgia. In 1778 Walton was commissioned a Colonel of the First Regiment of the Georgia Militia. He was injured in Battle and taken prisoner. He gained his freedom in 1779 through a prisoner exchange and was soon after elected Governor of Georgia, an office he held for only two months. Political conflict colored all of Walton's career. He was allied with General Lachlan McIntosh in a fierce struggle against Gwinnett for political dominance of the state. Walton was dispatched from office on several occasions, indicted for alleged criminal activities on others, in an interminable battle between two factions of the patriot movement in Georgia.